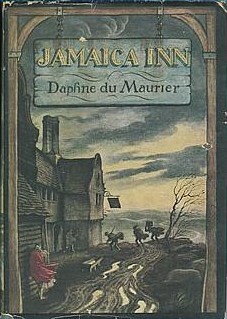 It was a dark and rainy day when I settled down to read Jamaica Inn by Daphne du Maurier, perfect weather for this romantic thriller about an orphan, a drunken innkeeper, a horse thief, and an attentive albino vicar. When her mother died, the orphan, a young woman named Mary Yellan, moved north to Jamaica Inn to live with her aunt Patience. Before even arriving at the lonesome inn on the moors, Mary began to hear rumors about the inn’s evil reputation. It turns out that Mary’s uncle, Joss Merlyn, is both a drunk and a criminal. At first, Mary assumes that his only crime is smuggling, but soon she learns of the murderous nature of his crimes and wonders how she might convince her aunt to escape with her. Can the vicar she keeps meeting on the moors help her? And what about Joss’s brother, Jem, a confessed horse thief? What is Mary to do about her growing attraction to him? Is he more involved in Joss’s activities than he will admit? Smuggling was dangerous; it was fraught with dishonesty; it was forbidden strictly by the law of the land; but was it evil? Mary could not decide. This question underpins many of Mary’s decision-making processes. When is a dishonest action evil? Just about every character in this book is morally compromised in some way, but at what point do they cross the line? Mary did not consider her uncle any more. She had lost her fear of him. There was only loathing left in heart, loathing and disgust. He had lost all hold on humanity. He was a beast that walked by night. Now that she had seen him drunk, and she knew him for what he was, he could not frighten her. Neither he nor the rest of his company. They were things of evil, rotting the countryside, and she would never rest until they were trodden underfoot, and cleared, and blotted out. Sentiment would not save them again. Evil turns a human into something other than itself, into a thing that can and must be fought. And Mary, as a good person, has the strength of will to fight. Mary herself is a sort of commentary on the prototypical Gothic heroine. du Maurier sets her novel in the early 1800s, the time of Ann Radcliffe and her many fainting heroines. Mary faints once, early in the book, and she despises herself for it. For the rest of the book, she’s the type to swear to give herself courage, jump off a porch roof, walk for miles in the cold, and offer to confront a dangerous man at gun point. She is fearless, we are told, and much like a boy. This point, that Mary in all her boldness is being boyish for standing up her herself fascinates me, though I disagree with it on principle. Mary is, in most respects, the kind of heroine many women want to see in novels. She’s plucky and fierce and smart, and she claims to prefer farming to romance. She’s certain that, given the chance, she’d be able to run her own farm. But she’s sometimes doubtful of her own strength, especially when it comes to matters of the heart. When she kisses the rakish Jem, she’s not sorry to have done it, but she’s determined to be the master of her emotions and not let her heart drive her into dangerous ground. At one point, this dilemma about Jem is treated as a battle between her boyishness and her girlishness. What a woman would do, and what a man would do is a minor obsession of the narrative. But I think du Maurier is being slyly subversive here because, in the end, Mary makes the choice of both a man and a woman. She refuses, right up to the end, to be tied down by these categories. Jamaica Inn reads like a good old-fashioned potboiler, but there’s a lot going on inside, once you scratch the surface. This is the fourth book by du Maurier that I’ve read, and with each book that I read, I love her more.I read this with the Slaves of Golconda reading group, so check out the Slaves blog for more opinions on the book. I haven’t seen the film of this, but I may see if I can find it. It’s the kind of book that could make a terrific film or a horribly cheesy one. Interesting post! I like your point about good and evil in Jem — I think one of the ways we know this isn’t actually a Gothic novel from the time of Radcliffe is that Mary seems basically okay with him being a smuggler. There’s more room for ambiguity about what being good means and what is acceptable behavior. I like your point also about how Mary makes a choice of both a man and a woman. I wouldn’t have been disappointed if she’d chosen the other option the book offers, and in a way, that would be choosing both genders as well (don’t want to give away the plot, so won’t get specific), just different aspects of them. I’ve been thinking a lot lately about depictions of evil in fiction (partly because of watching Breaking Bad), so I was really struck by how it was handled here. It seems like the way the characters treat other people is what it comes down to. Stealing from the rich isn’t directly harmful, but murder obviously is. Joss and the other main villain also demonstrate a lot of scorn toward other people, which is something you don’t see in Jem. That’s a good point about how either of Mary’s choice would have defied categories. And I would have been happy either way, as long at it felt like her own choice, which it did. But the more I think about the ending, the more interesting it gets. Rohan made a good point about Patience in her post that sheds a different light on Mary’s decision. I wonder what we’re supposed to think–if we’re supposed to think anything specific at all. I discovered DuMaurier in the late 50’s while in college..devoured each book like chocolate candy. Now am intrigued by the Slaves of Golconda..
I’m so excited to read more–I’ve just barely gotten started. And do check out the Slaves blog. We choose a book to read every few months, and anyone is welcome to vote and join in on the discussion. I knew I’d be a bit late joining in – and indeed my copy of this arrived today. But I’m starting in immediately and looking forward to it very much. It seems like everyone loved this. So glad you’re going to join in. I’m eager to hear what you think of it! I read du Maurier as a teenager and the only one I’ve returned to in recent years is ‘The House on the Strand’ which turned up on a Summer School reading list. I loved her books and really ought to return to them all at some point. ‘My Cousin Rachel’ has always been the one I considered her masterpiece, but perhaps I would have a different view if I read them now. I’ve only read three of her novels now, and one story collection, but My Cousin Rachel is my favorite so far. It’s one of the best novels I’ve read and maintaining ambiguity on multiple levels throughout. I really like your ‘take’ on Mary as a heroine – and on the ending. I had thought of it more in terms of a choice between plots or storylines, but you are right that the choice she makes disrupts clear demarcations between a “woman’s story” and a “man’s story.” For a potboiler, as you say, there’s a lot going on! I love books like this that can be read both as pot-boilers and as books with something big on their minds. That seems to be what du Maurier specializes in, which makes me want to read more. After loving Rebecca earlier in the year, I’m really excited to pick up Jamaica Inn and My Cousin Rachel this year. I waited years after reading Rebecca to pick up more of her books, and I’m so sorry I waited. Her other books (so far) are just as good. This isn’t one of my favourite du Maurier books but I did still enjoy it. I was also impressed by the way it managed to be both predictable and suspenseful at the same time! I’ve now read all of du Maurier’s novels apart from three which I hope to get to later this year and I’ve enjoyed them all, so you still have plenty to look forward to! I have Mary Ann and The Parasites on my shelf, so they’ll probably be my next. Are there others you especially recommend? I loved The Scapegoat and The House on the Strand, but I’ve found things to like in all of her books. Mary Ann is one that I haven’t read yet! I am embarrassed to admit that I have still not read anything by Du Maurier. I’ve started Rebecca a few times but for some reason it’s never gripped me. She’s an author I really think I would love, if only I could stick with her! I love Rebecca, but it gets off to a slow start. The feeling of menace in this one starts to build right away, though, so it might be a good one to try instead. This book is a lot of fun and easy to get into. I think you’d enjoy it! I read Rebecca before I knew of its reputation but then waited almost 20 years before reading another of her books because I was sure none of them were as good. So the weight of expectation worked differently for me. I read this a couple of years back and really enjoyed it. I always like du Maurier, especially when she’s getting weird and creepy. Weird and creepy is always good, and du Maurier does that well. Based on the small amount of du Maurier that I’ve read, I’m not sure anything is particularly typical of her. This is closer to a typical Gothic romance than Rebecca or My Cousin Rachel. >>This book is a great example of how a book can be entirely predictable, yet extremely suspenseful. I sort of felt that way about Harry Potter! I like Daphne du Maurier, and have only been disappointed in Frenchman’s Creek. I’m looking forward to Jamaica Inn myself, and your review has simply whetted my appetite. I recently watched The Scapegoat on NetFlix, and am eager to read that as well as the movie was absolutely first-rate. I believe Rebecca is the only film version of any of her novels that I’ve seen, and I’ve seen two versions of it and liked them both in different ways. Jamaica Inn would make a great movie–I’ll have to see if it’s on Netflix. Actually, now that I think about it, I’ve also seen films of her short stories, “The Birds” and “Don’t Look Now.” I loved both of those, although I have yet to read “Don’t Look Now.” Du Maurier’s “The Birds” is much scarier than Hitchcock’s.